We here at Boomstick have been very excited about a real sequel to the 1994 hit comedy ‘Dumb and Dumber’ for quite some time now. 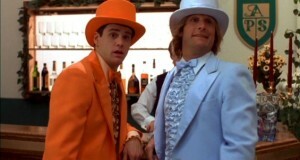 About three months ago or so, The Farrelly Bros. announced that both Carrey and Jeff Daniels would be back to reprise their iconic roles as Harry and Lloyd and that they were both very excited about returning to the film. Supposedly, Carrey was the most excited about doing the project according to ETO. Sadly, Carrey has left the project after, according to sources close to the project, became very frustrated by the film studios showing a lack of enthusiasm and regard for the project. Carrey said, “I would have thought ‘Dumb and Dumber To’ was a no-brainer, after all it’s implied in the title.” Hopefully a little more information will come out as to what the studios exactly did, but sadly, I don’t think we will be getting a ‘Dumb and Dumber’ sequel now. This entry was posted on Wednesday, June 20th, 2012 at 9:32 am	and is filed under Film, News. You can follow any responses to this entry through the RSS 2.0 feed. You can skip to the end and leave a response. Pinging is currently not allowed. « Check Out The Trailer for Pixar’s ‘Monsters Inc’ Prequel, ‘Monsters University’!!! [after V leads Evey up to an empty rooftop, promising her an orchestra] I don't see any instruments. Your powers of observation continue to serve you well.